Smart grids link various types of energy technologies such as power electronics, machines, grids, and markets via communication technology, which leads to trans-disciplinary, multi-domain system. 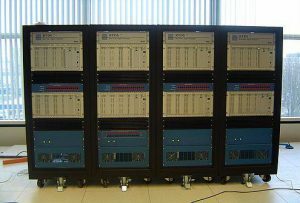 Simulation packages for assessing system integration of components typically cover only one sub-domain, while terribly simplifying the others. Co-simulation overcomes this by coupling sub-domain models that are described and solved within their native environments, using specialised solvers and validated libraries. Covering fundamentals and applications, the articles “Applied co-simulation of intelligent power systems: implementation, usage, examples” and “Co-simulation of intelligent power systems: Fundamentals, software architecture, numerics, and coupling” (published in the IEEE Industrial Electronics Magazine) discuss the state of the art and conceptually describe the main challenges for simulating intelligent power systems. As the focus of smart grid solutions is moving from a single system to a system of systems perspective, the increasing complexity results in growing engineering efforts and costs. For this reason, new and automated engineering methods are necessary. The paper “Engineering Smart Grids: Applying Model-Driven Development from Use Case Design to Deployment” (published in Energies) addresses these needs with a rapid engineering methodology that covers the overall engineering process for smart grid applications—from use case design to deployment. Based on a model-driven development approach, the methodology consists of three main parts: use case modeling, code generation, and deployment. A domain-specific language is introduced supporting the use case design according to the Smart Grid Architecture Model. It is combined with the IEC 61499 distributed control model to improve the function layer design. After a completed use case design, executable code and communication configurations (e.g., IEC 61850) are generated and deployed onto compatible field devices. This paper covers the proposed rapid engineering methodology and a corresponding prototypical implementation which is validated in a laboratory experiment. Compared to other methods the proposed methodology decreases the number of engineering steps and reduces the use case design and implementation complexity. Supported by ERIGrid, these papers present the work performed in the project on improving simulation-based evaluation and validation approaches.